Performance - English ivy is a reliable perennial ground cover in Kentucky landscapes. It generally evergreen, but leaves will darken during cold winters. 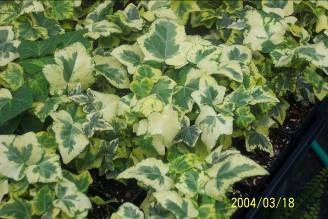 English ivy is easy to grow in partial shade or full shade. It is quite vigorous and will climb trees, walls or fences quite easily. Comments - The roots of English ivy can do significant damage to brick, wood or vinyl siding. Be sure to keep the plants from climbing if you do not want damage to your house. Varieties - 'Baltica', 'Hibernica', 'Thorndale'. 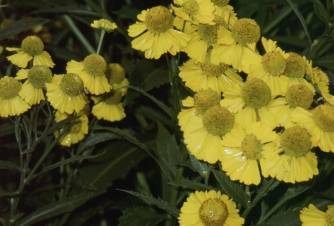 Performance - Sneezeweed is a reliable perennial for Kentucky gardens and a Kentucky native. 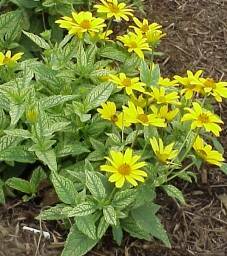 It grows best in full sun with moist, well drained soil. Dry soils should be avoided; powdery mildew will become a problem in dry conditions. Comments - This tall plant should be staked prior to flowering and cut back 1/3 after flowering. To reduce plant height, pinch the plant back 6 weeks prior to flowering. This will promote branching and possibly no staking. Clump division should be done every 2-3 years to avoid over crowding. Dwarf sunflower ‘Sunny Smile’ at Takii Seed Co.
Helianthus annuus - Annual sunflower - Sunflower is an annual which grows best in full sun in any type of soils. It is very heat tolerant. 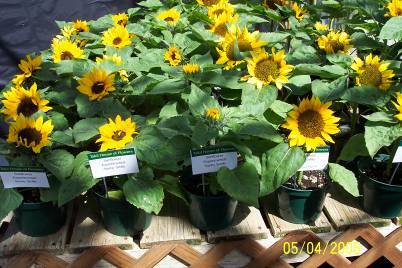 The foliage is not attractive, so growers tend to keep sunflowers for along fences or in vegetable gardens. The seeds are edible and are very popular for birds. The flowers should not be harvested until it has turned brown and dry. Dwarf - 'Big Smile', 'Pacino', 'Sundance Kid', ‘Sunny Smile’, 'Teddy Bear'. Intermediate - 'Chianti', 'Dorado', 'Elite Sun', 'Floristan', 'Lemon Flair', 'Moonshadow', 'Prado' series, 'Ring of Fire', 'Sonja', 'Starburst Aura'. Tall - 'Claret', 'Full Sun', 'Soraya', 'Sun and Moon' series, 'Sundown', 'Sunrich' series. More information and photos in HortFacts 51.11 06 – Sunflowers. 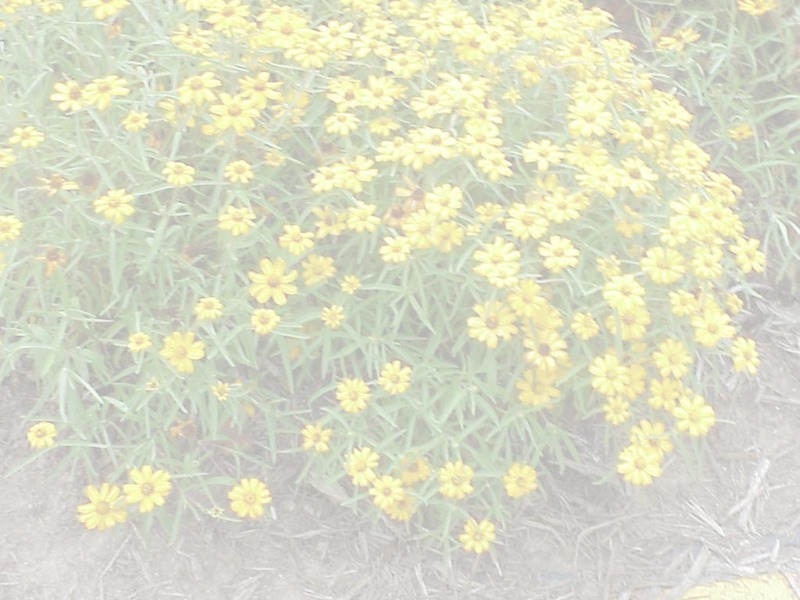 Performance - Strawflower is grown as an annual in Kentucky gardens. The seed propagated types are often grown in gardens while the new cutting types are commonly seen in hanging baskets and other containers. They grow best in full sun with well drained soils. Stem rot tends to be a problem when soils are too moist. 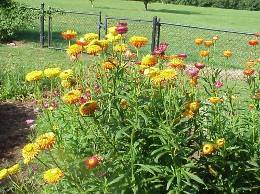 Comments - This is an excellent annual to grow for a cut or dried flower. When dried it holds its brilliant color very well. To use as a dry flower the flower must be cut just before the flower center opens. Strip the leaves from the stems and hang upside down in a dry, shaded place. Varieties - 'Bikini' series, 'Chico' series, ‘Florabella’ series, 'King' series, 'Salsa' series, ‘Sundaze’ series. 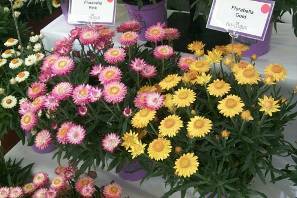 Strawflower is also called Bracteantha bracteatum. 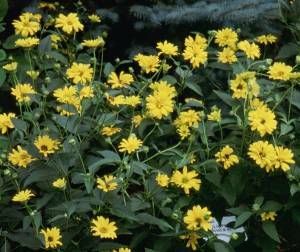 Performance - Heliopsis is a reliable perennial in Kentucky gardens and a plant native to Kentucky. It should be grown in full sun; no special soil conditions are needed. It does well at the back of the border and generally no staking is required. Comments - The mound of double blooms produced by this plant can be very showy, and it flowers much of the summer. 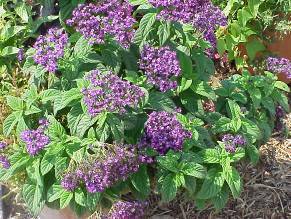 The plant is relatively coarse, so it is best in the back of the garden. Varieties - 'Summer Sun', 'Loraine Sunshine'. Performance - Heliotrope is grown as an annual in Kentucky gardens and grows best in full sun in moist, fertile soil. It needs abundant water during dry periods or it will wilt and fail to flower. Comments - It is a tender perennial treated as an annual in many regions. 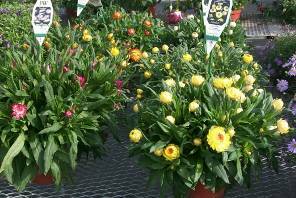 Its' wonderful fragrance and qualities of a cut flower are popular among many gardeners.